I discuss here some problems of Romance diachronic morphosyntax in the light of theoretical and methodological considerations on the relation between diachrony and synchrony, and the question of linguistic change. (a) ‘Laws’: are there laws of transformation through time, besides laws of analogy? In other words, do diachronic structures exist, in addition to synchronic ones? (b) The form–function relation: does this relation have the same properties in diachrony as in synchrony? (c) Syntactic factors in morphosyntactic change: is their role active or inert? Are the power and potential of Romance diachronic linguistics obvious? That they are not seems to me to be shown by the arguments that have arisen in recent years in North American Romance linguistics, as well as in schools of thought rooted in different theoretical and methodological approaches, such as diachronic typology, grammaticalization theory or generative diachronic syntax. 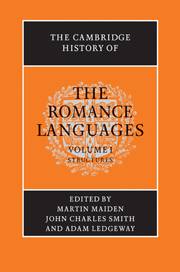 Following a preoccupation dear to Yakov Malkiel, founder of an authoritative American school of Romance linguistics, Stephen Dworkin has repeatedly called for a ‘rejuvenation’ of Romance linguistics, through openness to new theories and methods, and promoted stimulating exchanges of views between Romanists from different countries (see also Malkiel 1988:20). But how feasible is this? And what should this rejuvenation consist of? Are we to rethink old problems and domains of enquiry, or should we identify new ones, from the perspective of recent theories? Theories, of course, are never neutral with regard to the data they assume. In fact, theories impose their own specific empirical domains. This could be one of the crucial points of the question. Take the Chomskyan distinction between E-language (‘External language’) and I-language (‘Internal language’), nowadays widely used in diachronic generative syntax. From the outset research has focused on changes in I-Language; moreover, the primary explanandum is taken to be changes in grammars, mental entities represented in the minds/brains of individuals. E-languages, and the changes they undergo, are of little import, being considered mere epiphenomena (see Lightfoot 1999:74; 2003). Typical issues are: Why do French children have V(erb)-to-I(nflection) raising, while English children do not, and lower their ‘I’ (Lightfoot 2003:499). Or: How does the category change from noun to preposition (e.g., Lat. casa > Fr. chez) conform to an acquisitional principle such as ‘Minimize feature content’ (see Longobardi 2001:294f.)? Such questions and the kind of data they involve are very different from what the traditionally trained Romanist is used to. To apply the Chomskyan distinction again, the data may be said to involve E-language, which look, to boot, like rather restricted technical questions which some may regard as unexciting, such as: If the medieval geographical extension of derivatives of ipse in the function of ‘nascent article’ was much greater than today, how did it subsequently get reduced diachronically, both diatopically and diastratically? And how, conversely, did the continuants of ille in the same function gain ground, eventually establishing themselves over most of the Romània (see Aebischer 1948)? And are the plurals in -i of Italian and Romanian masculine nouns direct continuants of the Latin second declension nominative plural inflection -i, or must we postulate a more complex, less ‘economical’ and multi-staged, development (see Sabatini 1965)? Much of the strength of Romance linguistics resides in such questions, and in answers to them which harness together the multiple dimensions of spatial, social and historical enquiry, the interplay of which forms a leitmotif of the whole discipline (see Coseriu 1973; 1981; Malkiel 1988:20). Yet further, more wide-ranging, issues have also been raised. In 1978, in an article on the problem of language change (reprinted in Herman 1990), the eminent Hungarian Latinist and Romanist József Herman had discussed some ‘cluster changes’, mainly morphosyntactic and syntactic, and datable between the second and seventh centuries, which had major repercussions on the structure of the noun phrase and the sentence. These phenomena appear to have occurred in parallel: (1) simplification of Latin declension; (2) replacement of some case forms with prepositions; (3) appearance of new prepositional elements with a more definite spatio-temporal meaning; (4) tendencies to changes in word order; and (5) loss or weakening of word-final, consonantal and vocalic, segments. Herman was convinced that what was particular to historical explanation lay in: (a) the interrelations and mutual causes of changes; and (b) the possible connections between linguistic change and the circumstances of linguistic transmission (Herman 1978a=1990:362). Of course, different models of diachrony contain the idea of interconnected clusters of changes, reflecting deep structural adjustments (in the language or the grammar), yet these models all share the aim of rationalizing change. Think, for example, of the typological representation of clusters of adjustments affecting languages understood as objects external to the speakers, or the generative models which hypothesize ‘cascades of changes’ which grammars may undergo (see Lightfoot 1999; 2003; Longobardi 2001). In a more or less direct way both hark back to the functionalist conceptions of the early twentieth century, according to which change is not made up of independent adjustments, but occurs as part of a system of interrelated changes. If Herman generally follows this point of view, his position is clearly distinguished by its distance from typological and generative conceptualizations of the past few decades. I concur entirely with Malkiel, who held that Romance linguistics contains a ‘reservoir of priceless data’ and considered its diachronic domain one of ‘truly inexhaustible possibilities’ (Malkiel 1988:19). There is no reason to think that he was in any way calling for the abandonment of the traditional preoccupations of the discipline. This is clear from a dream he evoked, at the end of a resonant address in 1988 on the complex history of Romance linguistics, which appeared to him to take the form of a three-faced Janus. He called for the new generations of Romanists who had strayed away (to Malkiel’s regret) into synchronic studies, to return with renewed interest to the classic themes of diachronic linguistics, but to do this without ignoring twentieth-century developments. In terms that, perhaps, reflected his direct exposure to the world of North American linguistics, where diachronic studies had been reshaped by synchronic studies, Malkiel (like Herman) focused our attention on the essentials of history and diachrony, asserting their specific and autonomous nature. Yet is this wealth of data and historical problems, in space, society and time, of itself a strength of Romance linguistics, or is there a risk of its becoming a kind of locked strongbox, to which only tiny cliques of specialists hold the key, and whose treasures must lie largely unexploited? There is also the risk that diachronic Romance linguistics could become a mere auxiliary to diachronic speculation, a kind of ‘empirical data dump’, on which theories whose ‘historical’ nature is dubious could draw as they please. This risk may be emblematic of a new phase in the history of linguistics in which the unresolved contraposition of synchrony and diachrony in Saussurean structuralism, and the attempts to reconcile them within European and then North American functionalism, appear to have resulted in the abolition of both synchrony and diachrony, in favour of a universal grammar lying outside time, space and society. The classical problems of Romance linguistics may still be valid, but how are they to be addressed from a novel perspective? The study by Herman mentioned above seems to me to offer an excellent vantage point from which to assess the distance between an authoritative point of view subscribed to by many Romanists, and some recognized approaches in diachronic linguistics which are conspicuously concerned with language as a whole. One initial difference lies in the fundamentally sceptical view of diachronic theories manifest in Herman’s work. This is not to say that he did not attempt to give an organic and coherent representation of change, but he did have a clear awareness of the limits of representations of historical facts. He may have hypothesized that the five (morpho)syntactic changes mentioned above were manifestations of a single complex structural change, involving encoding of NP-internal relations and the relation of the NP to the rest of the sentence, but he did not think that this was a matter of causal determination in one direction or another. He concluded therefore that ‘there is no reliable and generally acceptable answer to the question of how these processes determine each other or indeed whether any of them takes priority of causal type over the others. We could refer, at most, to a negative conjecture: an old and simplifying causal solution can in all probabilities be excluded’ (Herman 1978a; 1990:365). The point is that Herman was convinced that historical linguistics had to be found specific and adequate models, quite different from physical–causational ones, and that the very concept of ‘historical explanation’ in linguistics lay largely unexplored. This fundamental scepticism also involves more specific but not unimportant issues, such as the chronological delimitation of changes. Herman makes extremely cautious use of periodizations, knowing that the date of first attestation is relative and that even frequent occurrence cannot be taken as evidence of the passage from one stage to another. The issue arises of interpretation of sources, especially written sources as reflections of spoken language – an exquisitely historical problem with enormous consequences for the analysis of change. For this reason, more or less accurate periodizations have for Herman a less central role than appears from some contemporary discussions, which retain the legacy of Neogrammarian-style positivist conceptions, apparent also in the widespread idea that the locus of change is language acquisition over successive generations of speakers (see Lightfoot 2003). Even further removed from Herman are models, such as diachronic typology and grammaticalization theory, which, in different ways, view change in terms of linear cycles. These are not historical cycles in the sense of modern historiographical debate, but rather evolutionary cycles. The concepts of ‘evolution’ and ‘history’, albeit often nowadays considered interchangeable, are profoundly different. Recall that in historical sciences this terminological fusion had already been successfully criticized, and superseded, in the final decades of the nineteenth century (see Tessitore 1991), as had the idea of the predictability of change, which in many theories was allied to a biological–evolutionary view of linguistic development. Herman’s approach is concerned neither with the origin nor the future development of a given phenomenon. From its origins Romance linguistics has been aware that a truly historical conception of language is a very different matter from a biological–evolutionary one. Consequently, however much one might agree with some recent generative critiques of typological–evolutionary models (see Lightfoot 1999:210), they look like an extremely tardy recognition of ideas that have been argued for in the theory and practice of Romance linguistics for two centuries. But the greatest split lies in the synchrony–diachrony relationship. Herman (1978a; 1990:357) rightly stressed an issue which still seems highly important twenty years on: the theoretical literature approached the problem of diachrony from the perspective of synchrony, ‘either by applying theories established within synchrony to the history of language, or by denying the possibility of a substantial distinction between synchrony and diachrony with reference to obviously perceptible traces of historical changes in synchronic state’. The subordination of diachrony to synchrony (or their interchangeability, which is only apparently different) has deep roots, but emerges distinctly in various North American groups of scholars in the 1960s. A thesis such as Hoenigswald’s (1960:3), that ‘much time and effort could have been saved if historical theory had been built on more explicit synchronic foundations’, although characteristic of conceptions of reconstructionist historical linguistics, has continued to this day to influence other domains of general linguistics concerned with diachrony (see Lightfoot 1999:266). At the Austin congress of 1967, Lehmann outlined the programme for a new diachronic linguistics, built on modern descriptive linguistics and concerned primarily not with structural units, or states, but the operations or processes which characterize the working of languages. Taking his inspiration from Praguean models of dynamic functionalism, he stressed the concept of the fluidity of languages with respect to synchrony and diachrony, a concept which, he held, emerges conspicuously if one looks at operations and not states. Yet the synchronic roots of such a programme are hard to deny, for various reasons: (a) it takes as basic the conception of an active ‘participant’ in change; and (b) the operations or processes are, after all, representations of events which express more or less broad movements in time, through descriptive schemas. In other words, the priority of synchrony over diachrony is reformulated as the priority of descriptive over truly historical linguistics (see Lehmann 1968; 1982). Such has been the mould of diachronic typology and, in different ways, other approaches to diachrony, over the last forty years. The ‘neofunctionalist’ programme had to contend with some fundamental difficulties, and there may have been excessive optimism about solving them: (a) the problem of the metalanguage, i.e., of the comparability of different linguistic phenomena in terms of universal analytic categories; (b) the problem of how to treat the form–function relationship in diachrony; and (c) the problem of whether theoretical models and sophisticated philological practices were really compatible. Perhaps the greatest difficulties lurk in this last problem, which is only apparently methodological: theoretical paradigms (whatever their nature) and historical–philological paradigms are far from easy to mesh together, without banal (or distorted) treatment of one or the other set of paradigms. At Austin, morphology and syntax, banished to the realm of synchrony by early structuralism, were put forward as new directions for research on language change: diachronic syntax was brought into the study of the impact of morphological paradigms on sound change, and both in turn were brought into the examination of the impact of sociolinguistic facts on linguistic structure. While Lehmann wanted wholesale transplantation of operational–descriptive models into diachrony, Malkiel’s Austin speech pointed in the opposite direction, with a clear attempt to bend synchrony towards diachronic investigation, in line with the dream of grafting some new branches on to the sturdy roots and the trunk of the old tree of Romance linguistics. Analogical–synchronic factors are considered as the limit of regular diachronic development, bound by so-called sound laws. These factors present both a source of phonetic irregularity, on the historical level, and a structural explanation of diachronic irregularities, on the theoretical level (see Malkiel 1968). Yet it seems certain that for Malkiel the historical perspective was to remain central and unchanged, with all its attendant array of technical and methodological tools, and conceptual problems. In a different way from typological and grammaticalization-based approaches, generativism has also defined a programme where synchrony (description) controls diachrony (historical representation). The study of diachrony is part of a broader programme of biological research on mind, centred on the theory of Universal Grammar (UG) and its relations with individual grammars (see Lightfoot 1999:266f.). The object of enquiry is change occurring in grammars as an effect of the ‘resetting of parameters’, on the basis of primary (external) linguistic data, which constitute the ‘triggering experience’, whilst changes in the external linguistic environment, considered accidental, are of secondary interest. Change is thus conceived as a different setting of parameters, occurring under particular conditions, which give rise to a discontinuity (or ‘catastrophe’ – see Thom 1975). The discontinuity is an event which occurs in synchrony, in individuals’ minds. In this mentalist framework the dependency of historical linguists on synchronic linguists is clearly spelled out. Only a synchronically based theory of grammar, a theory capable of accounting for the grammar of any natural language as emerging from normal childhood experience, would be able to explain which changes are fortuitous (i.e., attributable to environment) and which are necessary (i.e., grammatical and thus justifiable), while historians were bound to have but an uncertain answer (Lightfoot 1999:265f.). Possible change is therefore necessary change, imposed by the laws of UG. Whatever such laws are, there are good reasons to hold that change is only partially and perhaps marginally connected with such general principles. Syntacticians are embarrassingly silent on what it takes to set the parameters which they define. What makes historical studies so interesting is that one can sometimes identify cases where grammars change at some stage in the history of the language. If we are lucky, we can then identify changes taking place in the language just prior to the emergence of the new grammar. In that case, if our records are good, we are in a position to identify just what it took to trigger the new grammar. In fact, it seems to me that we can learn more about the nature of the triggering experience from language change than in any other way. This is no small claim, because unless syntacticians start identifying how their parameters get set by children, somebody is going to call their bluff and show that the emperor has no clothes. A priori [. . .] the ideally restrictive theory of language change should probably claim that diachronic change does not exist. This is so because, if diachronic change exists, we are faced with a dilemma: either one must assume that at least some primitive change is unmotivated (i.e. largely beyond the scope of scientific inquiry), which is incompatible with the ideal theory: or one loses any understanding of why the previous synchronic state was possible at all. Since it seems to be a fact that changes exist (and previous synchronic states, too, of course), the ideal (or perfectly minimalist) theory cannot be fully pursued. (5) the meaning ‘house’ is transformed into that of ‘general and abstract position’. Longobardi (2001:298f.) concurs with various Romanists in seeing a relationship between (1) and (2), which he expresses, however, in ‘causal’ terms ((1) caused (2)). His thesis is that change (2) is responsible for the whole set of changes (3)–(5) and that consequently (1) is the original change, external to the grammar, which gave rise to all the others. The notion that the triggering condition is external to the grammar opens the way to conclusions laden with theoretical implications: in the syntactic history of chez there was no resetting of parameters, and even syntactic change (4) might be considered a secondary consequence of a semantic change which occurred in another lexeme (Longobardi 2001:297–99). In effect, at the syntactic level nothing happened. This representation invokes continuity, as more generally expressed in the theory of inertia: ‘language is diachronically inert unless proved otherwise’. This model of reanalysis of a grammatical category has its attractions, especially when compared with the analyses offered by grammaticalization theory, which represent this type of change in terms of fluctuations – it matters not whether diachronic or synchronic – at the end of which there is a definitive ‘leap’ from one category to another. Neither approach is unproblematic. The analysis of the diachrony of chez is scarcely ‘historical’, in the sense, particular to Romance linguistics, of a systematic description of the characteristics of linguistic structures in their distribution in time, in space, in society and in the culture of individuals, and in the sense of an understanding of how such structures interact with external factors. The historical method adopted is really more of a typological–reconstructive one. And historical factors are exploited, simplistically, to demonstrate a given assumption. On the level of the diachronic model represented, the result is clever, rather than convincing (as I intend to show elsewhere). It is in Romance linguistics that the idea of the non-existence of language change has received a major theoretical formulation, at the hands of Coseriu. But his argumentation is quite different, being of a historical–empirical nature. As for diachronic minimalism, some questions arise. If language is diachronically inert, what is the point of turning to diachrony, from the point of view of grammatical investigation? Does the theory of inertia not deliver the coup de grâce to what was left of the notion of diachrony as a process of historical transformation dominated by grammar? And does it not amount to an unconditional surrender to external factors, which on this account are still haphazard and accidental? In that case, grammatical rationalism, taken to its logical extremes, would give rise to an evident paradox: the belief that everything in diachrony is purely contingent. The apparent supremacy of external factors in the generative theory of inertia is deceptive, for the logic of the theory does not favour the identification of such factors. Its ultimate aim is to represent grammar unaffected by the perturbations of change, so as to conform as far as possible to an ideally restrictive theory of change. Hence, unlike Lightfoot’s proposals, the ‘triggering’ factors of change are banished to the periphery of the grammar and even beyond. It is remarkable that, once this is done, the grammar may become indifferently a synchronic or a diachronic model. Yet another paradox seems to be that this leads by another route to the same general conclusion as the functionalists on the non-distinctness of synchrony and diachrony. This conclusion is reached in many respects from the opposite direction: the diachrony of the inertia model is by definition static, while functionalistic models are based on the concept of the dynamic potential of the activity of speaking.